D&G Dental is all-digital, which means we use digital X-Rays, intraoral cameras, and paperless charting to make providing you prompt and thorough diagnoses and handling dental health history a breeze. We want you to have stress-free visits to D&G Dental, and digital technology helps make this possible. These sleek hand-held cameras give us an immediate and magnified view of teeth and soft tissues. 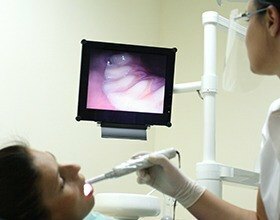 Dr. Dawoud tours your mouth with the intraoral camera, which displays images in real time on a chairside monitor, allowing you to see what he’s seeing at the same time. This will help you better understand recommended treatments and enable you to make great decisions for your own oral health. 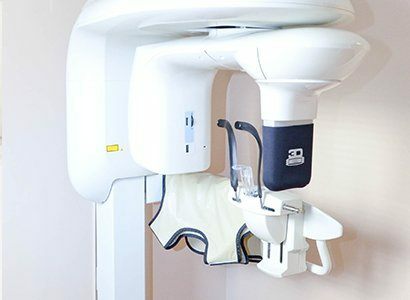 X-rays have been a crucial part of dental care for a long time now, but the traditional method of capturing them came with several pitfalls, including a tedious development period and potentially dangerous doses of radiation. 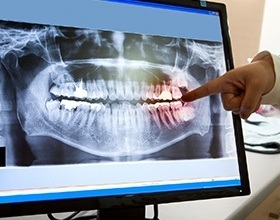 At D&G Dental, our digital X-ray technology has simplified this process and made it safer than ever before. There’s no need for a darkroom or hazardous chemicals – images are captured and transferred to the computer screen in a matter of seconds. They can be transferred easily to insurance companies or other doctors, and better yet, the amount of radiation patients are exposed to is reduced up to 90%. Keeping up with the latest and greatest in dental technology is an important goal for our team, and our soft tissue laser is a big part of that dedication. 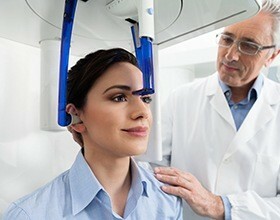 With this advanced tool, restorative and cosmetic care becomes more precise and comfortable for the patient’s benefit. 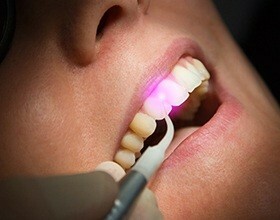 Soft tissue laser treatment is commonly used for cases of moderate to severe periodontal disease. Our team will be able to cut away diseased tissue, promote healing, and reduce gum pocket depth in a simple and effective way – the laser even sterilizes the area, minimizing bleeding and eliminating the need for stitches in many instances. Our doctors may also recommend soft tissue laser treatment in cosmetic cases, such as gum contouring or crown lengthening. When placing dental implants, we want to be as exact as possible, which is why we always use a computerized, laser-guided system when performing this procedure. 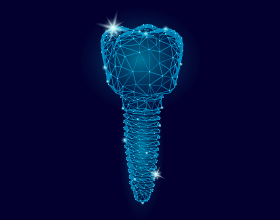 This enables us to be extremely precise down to the millimeter as to how deep and at what angle we position an implant, ensuring it provides the perfect foundation for a patient’s new tooth. It also helps us place implants without disturbing the surrounding oral tissues, which leads to less discomfort and swelling both during and after the treatment. 2D digital X-Rays are very helpful in most circumstances, but there are some instances where only a 3D image can give our team all the information we need for a safe and precise procedure. That’s why we’ve invested in a state-of-the-art cone beam scanner. By being able to view the nerves, bones, sinuses, and other relevant structures in their exact positions, Dr. Ghobadi can perform dental implant placement and other involved surgical services more successfully. Paperless charting is great news for environmentally-conscious patients and anyone who likes efficient, effective, and time-saving dental care. With digital record keeping, we don’t have to spend any time looking for your information – it’s all available at our fingertips! We can share your oral health history easily with other professionals when you need for us to, and paperless charting makes communicating with your dental insurance provider simple. D&G Dental wants you to know that we are committed to providing excellent general, cosmetic, restorative, and implant dentistry for Verona, Roseland, Cedar Grove, and other northern New Jersey communities. With sedation dentistry, we make stress-free care simple, and patients of every age are welcome. We maintain convenient evening hours, and we offer various ways for you to fit your dental care into your budget. You can just call us your one-stop-shop for everything dental care! Contact us to learn more today!